The Four is a Chinese film that came out in 2012 based on a novel of the same (Chinese) name. The Four takes its name from the four agents that are part of the Divine Constabulary. Iron Hands, Emotionless, Cold Blood and Life Snatcher brought together by Zhuge Zhengwo played by the great Anthony Wong must take down a counterfeit currency plot that threatens to un-stabilize the empire. This adaptation which mixes super powers and detective work is not your typical martial arts film. Rather in a fight between super powered martial artists and villains as well as zombie fighters, it plays out more like a Marvel comic book. As interesting as it may sounds the story suffers from an overly complicated plot despite the mysteries of the whodunit forsaken early on. With a huge cast of popular Chinese actors and actresses, it's confusing early on just who are the main characters and what each role plays in the movie. It's not until midway through does it become clear just who are the Four and we get to see their relationship with each other grow. My favorite of the four being Emotionless played brilliantly by Liu Yifei. Also notable in the cast is the diabolical and yet enigmatic villain An Shigeng played by Wu Xiubo. Each of the characters are fun to watch even if the story could have been better. What I really enjoyed is the soundtrack which has a modern pop/rock beat to it throughout. Considering the way the fight scenes are played out like the final scenes of the X-Men Last Stand, the music is very appropriate. But of course with more of a focus on the powered aspect in the fighting, the fighting choreography is less impressive in its action then say Ip Man. Overall, I still would recommend this film because I enjoy super heroes and thought it was an interesting take on the genre. 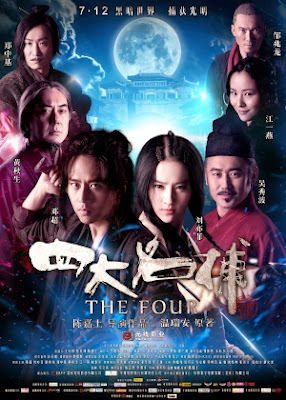 The film is currently available on Netflix and there is word that the sequel to The Four will be in 3D and out in Hong Kong in November. The film is in Mandarin with English subtitles. Win Passes to See Robert Redford's All is Lost!